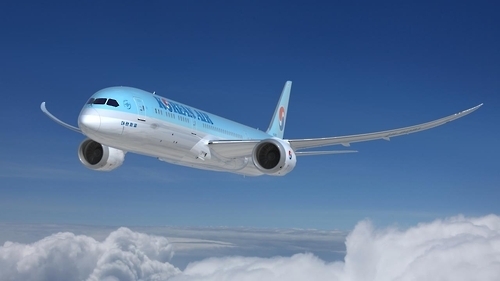 Korean Air Lines Co., South Korea's top flag carrier, said Sunday that its new Boeing 787-9 passenger jet has started service on a domestic route. Late last month, the airline introduced the Boeing 787-9 Dreamliner, the latest of its series, with 50 percent of its body made of reinforced carbon fiber that makes it lighter and thus more efficient than most conventional aircraft. The new passenger jet is 20 percent more efficient, while it produces 20 percent less greenhouse gas, the airline said. The aircraft also has a significantly higher cabin air pressure than other existing aircraft, making it easier and more comfortable for passengers to travel, the company said. According to Korean Airlines, the new passenger jet will operate on the Gimpo-Jeju route three times a day. Starting in June, the airline will also put the new passenger jet into operations on routes to Toronto and cities in other regions, it added.